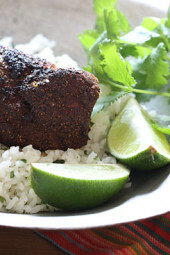 A lean pork tenderloin, rubbed with Mexican adobo and grilled or broiled to give you a great tasting, smoky, tender piece of meat. Pork tenderloin is the leanest cut of pork, in fact it’s just as lean as a skinless chicken breast, and it doesn’t take long to cook, which makes it perfect for busy weeknights. If you’re tired of making the same ‘ole thing for dinner, this is the answer (and bonus, it’s totally man-friendly). 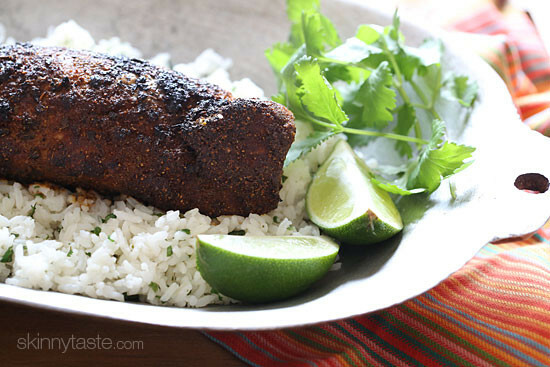 I was really in the mood for some Cilantro Lime Rice, and I thought it was the perfect compliment; I used some lime wedges to squeeze over the pork – delish! I was craving white rice, but I often use brown rice too as a whole grain option. For an even healthier side, last week’s Fiesta Bean Salad would also be fabulous! 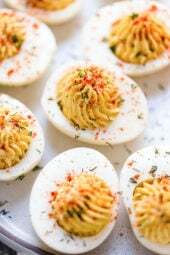 This recipe is from the cookbook Simple Food, Big Flavor, by Aarón Sánchez (you may know him as one of the judges on Chopped). Yesterday I made a batch of Aaron’s Adobo with full intentions of making this pork dish. I still have a lot of adobo left, so I’m going to use the rest to grill some pork chops this weekend. It was pretty chilly yesterday, so rather than making this on my grill, I used my broiler instead. 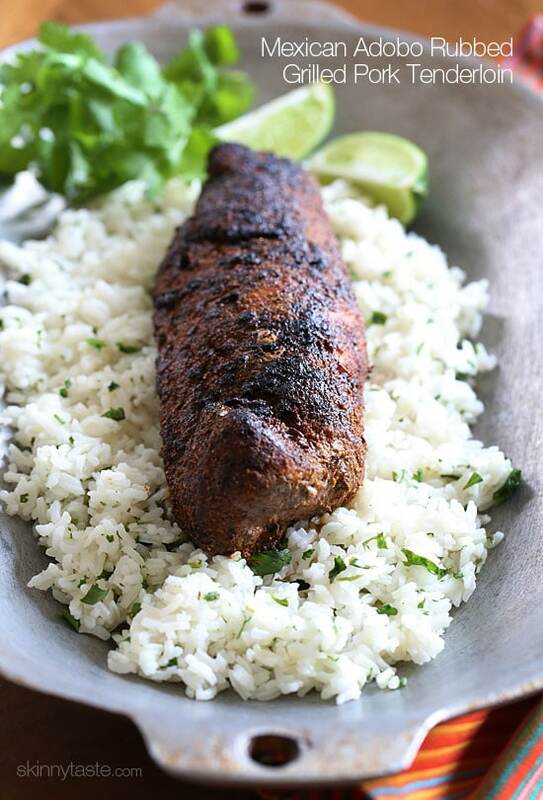 Rub the olive oil over the tenderloin and pat on the adobo. Set aside about 30 minutes. Meanwhile, preheat the grill to high, or preheat the broiler. Generously season the pork with salt. Grill or broil on high until an instant read thermometer inserted in the center reads 145°F, about 20 to 22 minutes. This is wonderful . I baked it in the oven on a foil lined broiler tray for about 40 minutes at 375 and checked it with a thermometer periodically to be sure I wasn’t over doing it. Wanted it around 145 degrees. We loved it.. Had Penzey adobo seasoning. It was rubbed with the spice and then actually didn’t get cooked till the second day. Another favorite. (I think all your recipes are) They all work beautifully. Can one use adobo sauce from chipoltle chilies? The different seeds and chilies were hard to find. I didn’t think the rub was all that great. It was just okay for me. Too much work for a mediocre rub. Question: If I have a bigger pork tenderloin than 18 oz, and plan to cook the whole thing and have leftovers, how much of the cooked pork tenderloin = 1 serving? I know raw and cooked weight are different . Thanks! This came out INCREDIBLE! It is going to rank pretty high on my list of great recipes I have gotten off of here. The pork was so tender and so delicious. It was a hit with my family! I served it with the fiesta bean salad (I added a little feta). I know you tried this recipe more than 3 years ago……but I have the same question. How did it turn out using GOYA Adobo seasoning? Hoping to make this tm night. I made this tonight for Cinco de Mayo and the family loved it! Served it with fiesta bean salad. Thanks once again for another great recipe! Gina- this was absolutely delicious! I didn't have all of the ingredients to make Aaron's adobo, so I waxed eloquent a bit… was great under the broiler on a rainy Sunday! 🙂 My favorite Skinny Taste recipe yet! 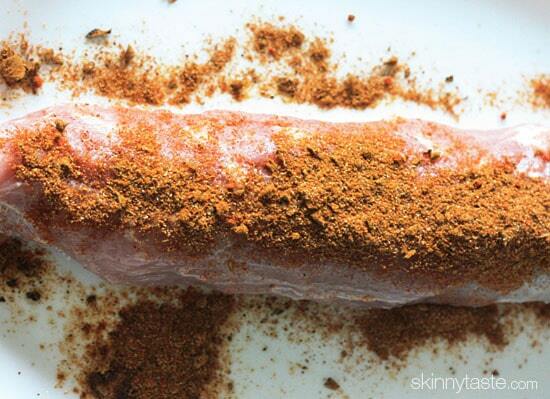 That looks like a very nice pork rub. I may have most of the ingredients already. Thanks for sharing. I am making your Sesame Chicken right now and I just had to let you know I LOVE what you do with this blog. 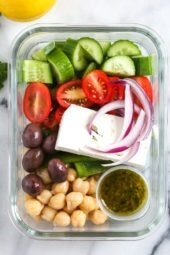 I started WW in January, I've lost 45 pounds and 99% of my dinner recipes have come from this site! My husband is a professional Chef and he has loved every meal I have made for him. I just wanted you to know how much I appreciate all your hard work! I have a friend who would just love this. I'm making it this weekend and inviting him over!! this looks delicious! I have been on a pork kick as well! 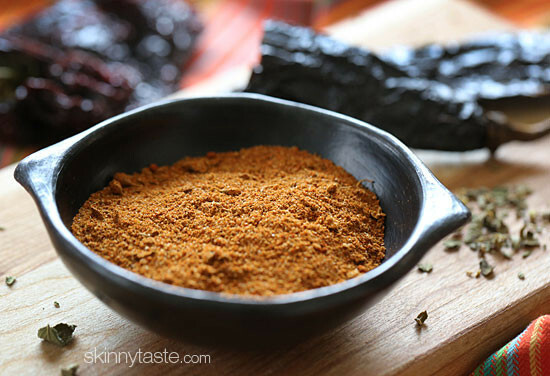 Huge pork loin fan – will definitely have to try this rub! 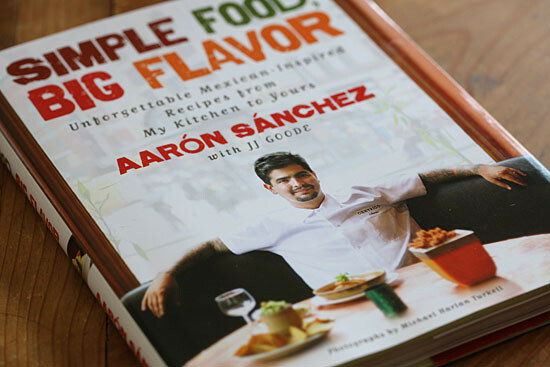 I once met Aaron Sanchez when I went to a barbecue workshop and he was just plain adorable! You're on a roll with the pork recipes. So scrumptious, and beautifully styled! This looks irresistible, Gina! This looks fantastic! Great recipe for the upcoming holiday too. This looks amazing and I love Áaron! I don't eat pork, but do you think this would work well on a grilled whole chicken? This would be awesome on a grilled whole chicken!! This looks so yummy! We had family in town and over did it a bit so now it's back to meat and veggies. You are definitely making the switch back tastier. 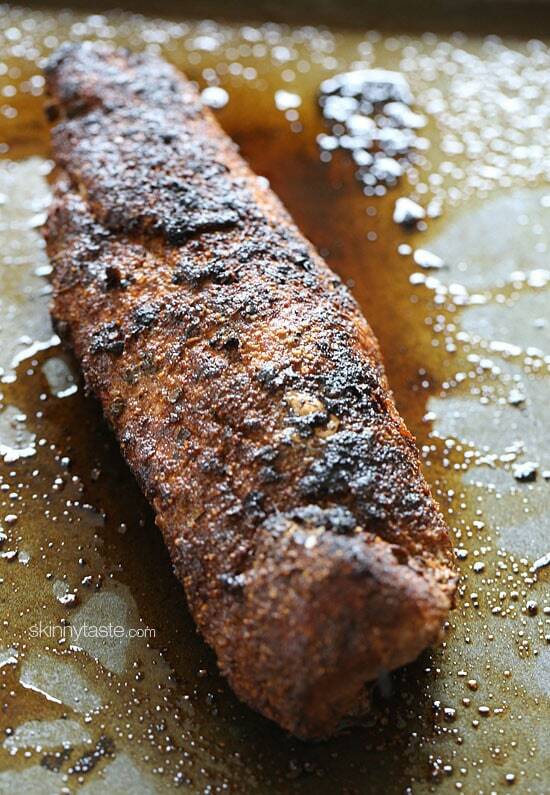 I have only baked a pork tenderloin… you can broil it?! On high? Do I turn it and where in the oven should it be… I would have though it would dry it out and burned the outside! Yes, I put it in the center, it's just like grilling it. I did keep an eye on it and turned it often. If you don't trust that, bake it on 450°. As long as you use a thermometer to check that it's done, you will be fine. Gina, where in the oven do you put it? Middle rack? Lower than that? 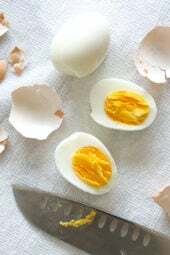 I love that this recipe has less than 5 ingredients after you make the adobo which can be made way in advance! Makes dinner a breeze! If I wanted to bake this in the oven what temp and for how long? Yum! Love when you post grilling recipes. Keep them coming! It's homemade, click on the link, it was yesterday's post. mmm definitely will try this !